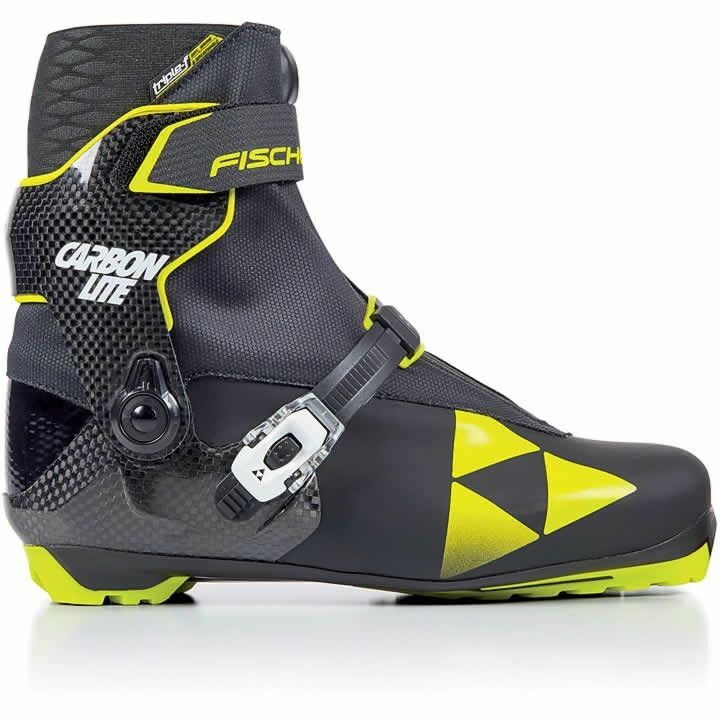 Featherweight racing boot with World Cup experience: the Fischer Carbonlite Skate Boot features a new Carbon Heel Counter for enhanced stability. It's World Cup technologies offer the optimum set-up for outstanding achievements. Breathable Triple-F membrane ensures feet stay warm and dry. World Cup Carbon Crosslink: External stabilizing elements made of high-strength carbon fibers fix the WC Carbon Cuff to the boot, ensuring the high degree of torsional resistance. Fischer Speed Lock: Revolutionary quick lock with minimum size and weight. Simply pull the laces tight and that's it! The system is safe and reliable. Ratchet Lock Buckle: Fastening element for cuffs and instep straps featuring fine ratchet adjustment and stretch-free power transfer. Instep Strap: Additional outer fastener. Makes the foot even more secure and enables better power transfer. World Cup Carbon Cuff: Perfect side stability and outstanding freedom of movement longitudinally. Shaped specially for the foot, light as a feather and embedded in soft EVA. Triple-F Membrane: Special membrane ensures that conditions inside the boot are perfect: dry, warm and breathable. Lace Cover: For additional protection against the snow and wet conditions and to give a comfortable warm feeling. Frame Technology: This innovate technology for 3-dimensional foot fixation offers more support in the decisive positions. Seamless, waterproof and long lasting.